In this latest installment of Cooking for your Health, the focus is on promoting health and weight loss without sacrificing the pleasure of good food. Low-fat, nutrient-rich diets do not need to be boring or tasteless. 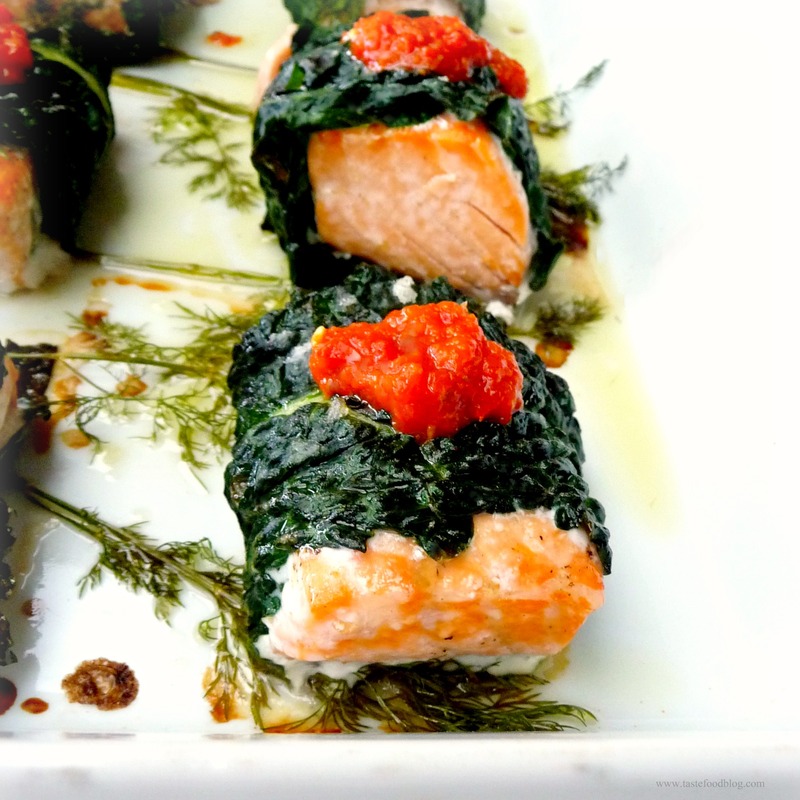 This recipe for Salmon Wrapped in Kale Leaves with Dill and Harissa proves just that. It’s a healthy and delicious meal which will nourish your body and provide essential vitamins, nutrients and protein. It’s also an easy recipe to prepare, yielding elegant, dinner-party results which will be enjoyed by all, whether they are on a diet or not. Salmon is a top protein choice low in saturated fat, rich in vitamins B and D, minerals and Omega-3 amino acids. Teamed up with kale, a cruciferous superfood packed with cancer-fighting antioxidants, you have a dream meal that is a nutritional powerhouse and tastes great, too. The earthy kale leaves pair beautifully with rich and buttery salmon. A squirt of harissa and a few frizzy dill sprigs crown the wraps with vibrant heat, color and spice. Eating for your health doesn’t get any better than this. A spoonful of homemade harissa brightens this simple recipe. Sriracha may be substituted for the harissa. Serves 4 as a dinner course or 8 as a light lunch. Remove and discard the tough stems and ribs from the kale, leaving the leaves in tact. Bring a large pot of salted water to a boil. Add kale leaves, and blanch briefly, 15 seconds. Transfer to ice water to cool. Drain and dry thoroughly on a kitchen towel. Preheat oven to 350 F. Coat bottom of a baking pan with olive oil. Select 8 large dill sprigs without stems and set aside. Scatter remaining dill sprigs with stems over bottom of pan. Brush salmon filets with olive oil. Squeeze 1/2 lemon over the salmon. Lightly season all over with salt and pepper. Place salmon on kale leaf. Wrap leaf around salmon. If necessary, use another kale leaf to sufficiently cover. Arrange the the kale-wrapped salmon over the dill in the baking pan, seam side down. Repeat with remaining salmon and kale. Brush olive oil and squeeze more lemon over the fish. Sprinkle with a little more salt and pepper. Bake in oven until salmon is cooked through, about 30 minutes. Serve warm, garnished with a spoonful of harissa. Wow, what beautiful colour on these. I never though of using kale like this, great recipe idea! A wonderful idea and recipe! Very healthy. What a great idea! I’ve used chard in a similar way, but not kale. And what a healthy, beautiful dinner to boot! Salmon is a weekly entrée here, and this is going to be my next recipe using it. That picture is insane. The color contrast and detail. Great job. This is brilliant! Love this simple way to dress up salmon and make it even more healthy. Thanks for sharing this great recipe, Lynda. Also, I’m having a great giveaway today with four potential prize winners, so you should enter! Looks so pretty and you can’t get a healthier meal. The kale is perfect for wrapping…a good size and easy to handle when blanched. This is really inventive and delicious looking. Nicely done! As you know, I am no fan of salmon, but I can totally see serving a nice piece of halibut this way too. YUM….and so pretty. This just went on our menu for this week – love everything about it. I’m always looking for more to dollop sriracha on, too! What a beautiful and healthy dish. I made this dish yesterday and it was a huge hit! Your instructions were very clear. . . and I can’t wait to make it again. Thank you for letting me know. I’m so happy you liked it! Im adapting your recipe to wrap bison meatballs kale…thanks for the help! Such a tasty and healthy recipe. Ate about 10 pieces and it felt so light. Made it with wild salmon and Mina Harissa which I found at whole foods. We’re making it again for a dinner party.